Growing up in Plymouth in the 90s was both a burden and a delight. The generation of Plymouth today are incredibly lucky, accessible shops at their disposal in a warm, dry shopping centre, coffee shops on every corner and wifi in pretty much every part of Plymouth. I might sound hard done by, but I promise I’m not. Sure we never had these things growing up, but it’s definitely shaped who I am today, and damn there were some pretty great things that people who didn’t grow up in Plymouth won’t ever know existed. So for all of you who had the privilege of growing up here, do any of these sound familiar? 1. Woolworths – Every trip resulted in being dragged round the store by your parents, lets not mention those fleeting moments of panic when you lost your mum in an aisle. The rest of the day would be spent feeling guilty for stealing that 1p sweet from the pic n mix. 2. Destiny’s under 18s – Let’s face it, if you didn’t go to destiny’s under 18’s nightclub at least once, were you really a teenager? For only £10 you had unlimited access to FREE coke and lemonade for the evening. The night ended at 11pm, where you’d find everyone’s parents waiting outside. 3. Pavillions & Ballards – the hardest decision of the summer holidays was whether to go to Ballards or Pavilions. Pavilions had the snake and the orange slide, not forgetting the waves machine. Whereas ballards was THE place to go for a float session, foam crocodiles, boats, rings – it doesn’t really compare to the Life Centre. 4. Toys R Us – Every Sunday you begged your parents to take you to toys r us for the latest barbie doll or bicycle. The day always ended in your mum moaning about how hot the shop was. 5. Rain – If there’s anything you’ll remember about your childhood it’s the amount of rain. You couldn’t enjoy a trip to the hoe or an afternoon out without there being rain. Heaven forbid thinking about the flared trousers everyone wore in the 90s that used to soak up water like a sponge. Well at least one aspect has always remained consistent in Plymouth, right? 6. Wooden animals – Those wooden animals/statues in town that were the highlight of any trip into town. Long gone, but never forgotten. 7. Drake Circus (pre mall days) – C & A, Marks & Spencers Children Wear, Next Outlet – well at least we can afford to be a bit more fashionable now. 8. The Drake Cinema – The iconic cinema of Plymouth that still to this day has a replica of the golden hind ship above it. You can’t miss it coming out of Varsity half cut on a Saturday. The Drake Cinema was long before the days of extortionate VUE ticket prices and when you took a bag of woolies pic n mix with you that only cost £0.69, score! 9. Diving Boards – A true landmark of Plymouth. Summer holidays were spent bombing off the top board on the hoe, no attention was ever paid to the tides or the fact you COULD break your legs. Funny that they finally got removed in 2010, heh? 10. School Trips – The prime destinations for any primary school school trip, you’ve probably been to at least two of the following; The Dome, Saltram House, Mount Edgecumbe, Morwellham Quay, National Marine Aquarium, Paignton Zoo and The Central Library to name a few – all in CJ down coaches of course. 11. Jane Norman Bags – The ONLY acceptable bag for girls to put their P.E kit in. Cue begging your mum to buy something from the shop so you could have the bag. 12. The Plymouth Dome – You’ll probably have visited the Plymouth Dome at some point during primary school. But lets face it, the best part was getting sweets from the gift shop on the way out. 13. The Sails of Sainsbury’s – That moment you know you’re home when you spot the first sight of the ski slope and the iconic white sails of Sainsbury’s, thank you Lord. I still appreciate this now, and I’m 23. 14. Whacky warehouse/Deep Sea Den – The place that every child anywhere in Plymouth had their birthday party. You’d already been there 3 times that month, but did you care? No! 15. The Sundial – Meet at the Sundial at 12? This was legit the ONLY place you could meet up with your friends in town. Be there or be square. 16. The Life Education Caravan – AKA the best hour of the school day. It only happened once a year, but when it did it was amazing. There was always an argument over who got to touch Tammy’s body’s parts and hold Harold the giraffe first. 18. Plymouth Airport – You’ll either have used this facility frequently, or never have known that an airport even existed in Plymouth. 19. Derry’s – Those Saturday morning trips to Derry’s for school uniform and school badges was a dreaded occurrence, the highlight was getting to go to the cafe on the top floor afterwards. 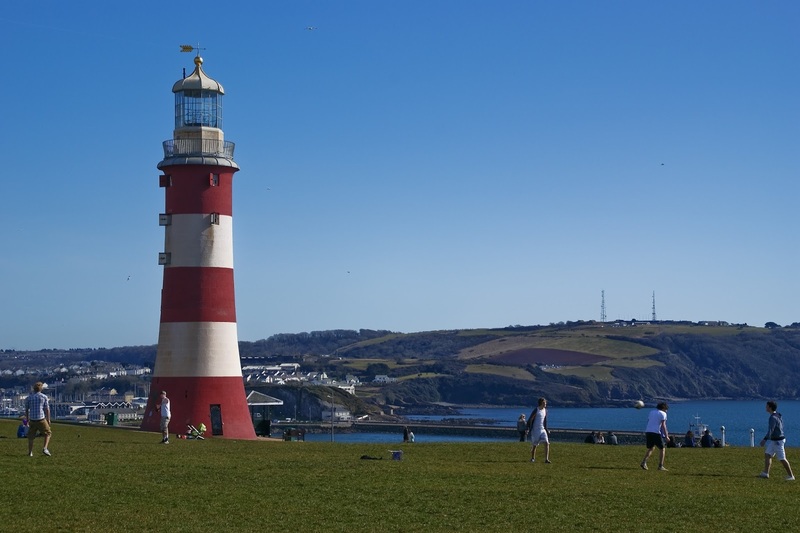 What else reminds you of growing up in Plymouth?